The energy of Aries and the carelessness of Gemini create relationships based on action and ideas. These two are a good pair, but at times the atmosphere between them becomes heated. If you observe these relations from outside, you will be fascinated by the exchange of ideas and enthusiasm, but the plans will not necessarily be enforced. The reason is that both Aries and Gemini lack perseverance. They are even able to begin to implement these plans, but soon they will completely forget about them. Of course, unfinished business does not bother them. They are united by a desire for progress, not constancy. The main thing that can be said about such a combination is that they really enjoy each other’s society and in many respects call each other better qualities. The parent, born under the sign of Gemini, sometimes gets a little distracted - until the Aries-child calls for undivided attention. Aries-baby appreciates this flexibility. This mother will not want to give him such an opportunity, and she will always have a quick response to any impudence. She also will not go past the outbursts of his annoyance, however, she is clever enough to answer them with laughter or even ignore them altogether. But if he loses his sense of proportion, her sharp remark will quickly put him in his place. Fortunately, all this is quickly forgotten and forgiven, and between them again the friendship is restored. The Aries-child makes his mother feel especially young and energetic. Together they often behave quite childishly and, indeed, enjoy each other’s company. She will support the desire of her child to make friends, join youth organizations, early teach him to swim and, in general, take as much of life as possible. The only thing that can interfere with them is the very unstable mood of the Gemini Mom, which sometimes confounds the open and optimistic child of Aries. And then, even the sociable Aries is not easy to follow the constant change of her interests and acquaintances! Gemini dad is ready to be the best buddy for his merry little Aries - while everything is bright and joyful. He enjoys the active, sincere nature of his child, but only until the tears or boring everyday problems that could spoil everything begin. Father-Gemini loves freedom. How good that you can go to the pub, work out-of-hours or go out of town, without wasting time on the fees! Aries is also a freedom-loving, spontaneous and rather selfish little creature, so they can understand each other with their father. Aries likes to fight with his father. Gemini dad has a good reaction, which corresponds to the physical acuity and strength of his child. He, like no one, can stimulate the activity of the mind and imagination of Aries with the help of new games and a stock of unusual, interesting facts and stories. Aries is ready to adore his father for the brilliance and speed of his mind! Emotionally, Gemini dad always looks a little detached. And he can not refrain from teasing his child, realizing that he has mental superiority. Gemini consider emotional scenes as inconvenient for themselves and in general too serious, and the child-Aries sometimes displays his violent temper. 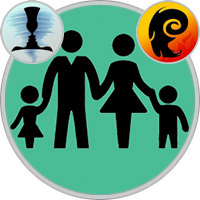 Father-Gemini will provide an understanding of the whole mother, although his emotional peace gives him a good opportunity for a more heated conversation, if you need to call the child to order. At times, he is very strict, but the child-Aries is ready to respect the very fact that his father knows exactly what he is doing.